Add a Second Hard Drive or SSD to your HP Envy 15-v000 series laptop using your laptop's optical drive bay. Add it as a second hard drive in the laptop in lieu of a SATA Optical drive. 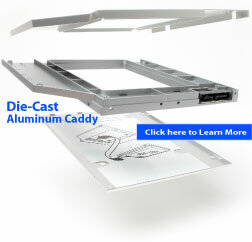 This caddy is designed for you to transfer your optical drive faceplate / bezel to the front of the drive caddy.